Question of the Week: – What has you most excited for fall, beauty product or otherwise? Answer: Noo clothes! I love buying for the colder weather. Coats, jeans, scarves and boots – I really have to reign myself in when it comes to Autumnal shopping. Oh and did I mention red lipstick? I’m a bit too conformist to break out my reds in the Summer. Hurry up Autumn! we heart this – discovers a mascara with a TRULY original feature, a squeezable tube that lets you control the amount of product on the wand. Check out LashControl. Beauty Junkies Unite – See why we’re loving the latest from LORAC for fall, the Naked Lace Collection. Clumps of Mascara – Has found the best drugstore lip gloss to date. And they only cost $2.29 a pop. Gouldylox Reviews – Not sure what eye liner will give you the purrfect cat eye? Check out these tips and tricks meow to get the look your longing for! 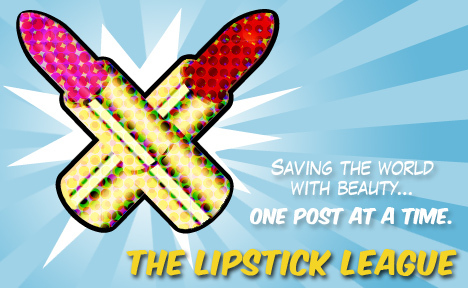 Krasey Beauty – Looking for a lipstick that will bring you only high octane color and shine? Check out the new Urban Decay High Shine Lip Pencils! Nouveau Cheap – What’s my favorite part about Halloween besides candy corn? Wet n Wild’s Fantasy Makers collection, of course! Pink Sith – Is having a giveaway for her holy grail of sunscreens! Elta MD UV Clear SPF 46. Enter today, giveaway ends on August 30th, 2011! Prime Beauty – gives us a glimpse of the New York City inspired Paul and Joe Manhattan Fall Collection -see what gems she scored and what she’s still lusting after. Phyrra – Tentacles anyone? Phyrra shows you the latest way to adorn yourself in her review of Deceptions jewelry! Come on dear readers, how about you? What has you most excited for fall, beauty product or otherwise? Berry lips and nails, hot chocolate after a Christmas shop (yes I shop in Autumn for Xmas!) The smell in the air, walks in the park when its crisp and cold but the sky is blue, the orange trees, being indoors on a dark evening with rain battering the window while I am snuggled on the sofa, Halloween, stew, scarves, baking. Betcha can’t guess my favourite time of year! New clothes are definitely the best thing about Autumn for me, lovely over the Knee or knee length boots, warms coats and faux fur stoles/gillets. I’m looking forward to the dark lips and nails, the winter debate ie; will it or wont it snow in winter therefore are snow boots a winter necessity, Starbucks white hot chocolate, hats and gloves, pink noses from the chill, the sparkle of frost on the ground, knowing christmas is close and being able to cover up those few holiday pounds under beautiful clothes.